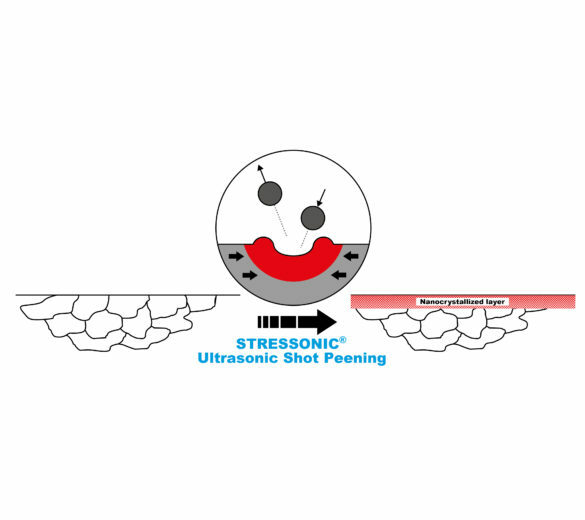 Ultrasonic shot peening creates, under certain conditions, severe plastic deformation on the surface of the work piece. This plastic deformation allows the formation of nano-scale size grains which will give the surface of the metal part specific characteristics. The advantage of the process is that it is purely mechanical, and cold, and therefore requires no chemical or thermal treatment. The desired effect in this case is mainly an improvement of the surface mechanical characteristics of the material. In this case the nanocrystallisation is combined with a thermochemical treatment (nitriding, carburising, chromising). Indeed, the nano structure formed is favourable to the diffusion of elements such as nitrogen, carbon or chromium.